NPR voice: This week in Advice for People Who Didn’t Ask, we focus on two men of significant ambition who are making perplexing decisions. President Trump just took a drubbing on immigration, undone by the deadly competence of Speaker Nancy Pelosi, who is now generally regarded as the answer to the question: “What if a Prada bag with a gun in it became a person?” That is from former Obama speechwriter and leftist provocateur Jon Lovett, and it’s a good line because it is true. 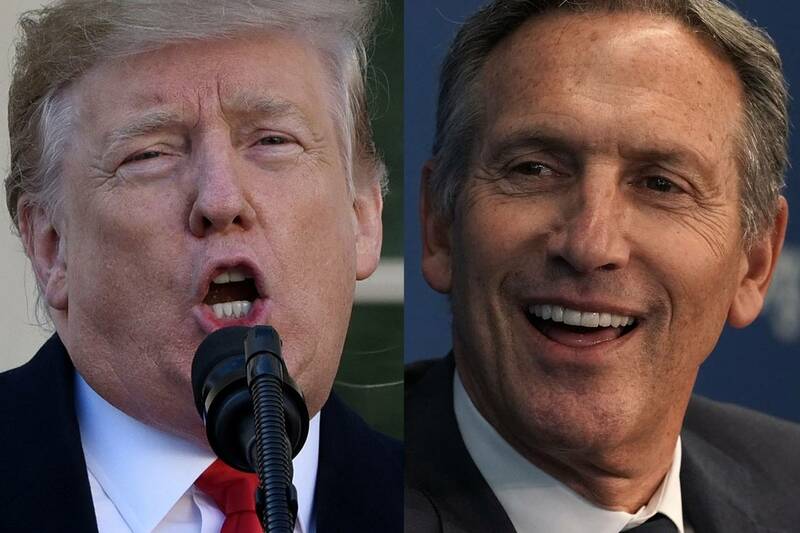 President Donald J. Trump and former Starbucks Chairman and CEO Howard Schultz. If no deal is struck, the president can risk another shutdown or attempt to secure wall funding by declaring a national emergency. The more-serious Republicans do not want that historic precedent set, and in any case it would get bogged down in the courts. Join us on March 4 as WSJ Opinion’s Paul Gigot leads a “State of TV News” panel discussion including Fox Business’s Maria Bartiromo, CBS’s Christy Tanner and “Network” actor Tony Goldwyn. Included in your admission to the event is a ticket to see “Network” on Broadway at a subsequent date. What should the president do? Survey the field after battle and notice that some of the landscape has changed. For a solid month Americans again focused on illegal immigration. In a country that’s never thinking about only one thing, that was a bit of a feat. Also, Mr. Trump in his statements and meetings with the press came across, for perhaps the first time, as sincere and informed. Previously he’d looked like a guy who’d intuited a powerful issue and turned it into a line. Congressional Democrats did not seem sincere, and a lot of them found it necessary to say they very much want the border secure. They made a point of speaking of their fidelity to the idea. They were telling the people back home: I acknowledge there’s a problem and want to help. At their best, Democrats oppose the wall as a matter of political aesthetics. A big, fat, glowering slab of concrete on the edges of America is . . . brutalist, unlovely, aggressive. That’s not who we are! The Democrats must defeat the president on that one word. The president should let them, while pretending it pains him. But the president himself has given up on the idea of a wall specifically. He spoke often during the shutdown of barriers, structures, smart tech, dedicated personnel. He knows one big wall won’t cut it. He’s taken to talking about tunnels. Walls don’t stop tunnels. But he can’t admit he’s backed off on the wall, and he loves his showbiz, so now and then he says, “Wall, wall,” and whoever’s around him will say, “Yeah, wall.” He should stop. Mr. President, tear down that word. While Republicans on the Hill are negotiating, he should go to the country in a new way, making an earnest case about the benefits of ordered legal immigration and the threat of illegal chaos. He should go not to his usual big rallies but to the old Republicans, the people who voted for Bushes and Romneys—an audience that doesn’t love him no matter what. He needs not the solid one-third who support him but the not-solid third who might go this way or that. And they should be seated, not standing there waiting to cheer. He should be so brave he doesn’t have to be exciting. He should push and push and then accept a solid deal that doesn’t mention a wall but includes everything else. Then he should act defeated. He should run around looking slump-shouldered and lost in his big blue overcoat. It won’t be hard! He should ask the media please, in the coming year and now that a deal has been passed, to cover the border, talk to people who work there, find out if what we’ve done has controlled illegal immigration. Now to the second man of significant ambition—Howard Schultz, who may run for president. What a great story he has. A city kid from New York, from the real working class and with the truest, most reliable working-class trope: family pain. Nobody gave him his first million. He builds a company, spreads his product through the country and the world, creating 238,000 jobs as of 2017. And jobs build families. This is a public good. But he’s a neophyte who’s not a natural, a novice without magnetism. I don’t see his constituency. And his theory of the case is wrong. He’s fiscally to the right and on social issues to the left. There’s some market for that, but is it really where America is going? But his immediate problem is the Democratic Party, which has grown newly strategic and is about to pummel him. Democrats will never forget—and it is understandable that they will never forget—what Ralph Nader’s Green Party candidacy in 2000 did to Al Gore. Mr. Nader’s 97,488 votes in Florida kept Mr. Gore from becoming president, and elected George W. Bush. They feel they are this close to taking out Mr. Trump. They are not going to let another independent get in their way. Mr. Schultz had better know what’s coming. As the Twitter meme goes, would they kill baby Nader? They would.